In the world of social media, it’s easy to become overwhelmed in a sea of profiles and status updates. With so many services and so little time, wouldn’t it be nice if posting to your social media profiles was as simple as sending an email? With Posterous, it is. Posterous allows you to post to 20 or so social media platforms via email. Posting to LinkedIn, Facebook, Twitter, even YouTube and Picasa is as simple as sending an email. And we’re not talking simple text-based posts either. With Posterous, you can create full-screen photo galleries, groups for sharing and collaborating or just simply pass on an article you read on the Internet all by sending an email. Add a smartphone and you’ve got a powerful way to create and share content on the road. At its core, Posterous is a blogging platform similar to Tumblr. You can get a dedicated URL that provides a hub for your content, customize the look and feel of your Posterous site and add static content such as an “About Me” page. What separates Posterous is its ease of use and ability to distribute to a number of social media channels all at once. 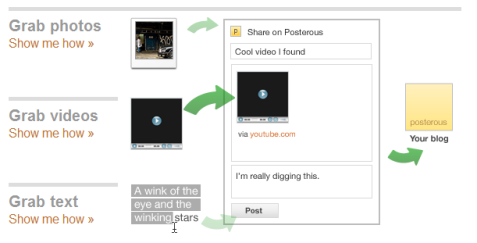 Getting started on Posterous is about as easy as it can get. You don’t even need to open an account. Just send an email to post@posterous.com and you’ve got your first blog post. 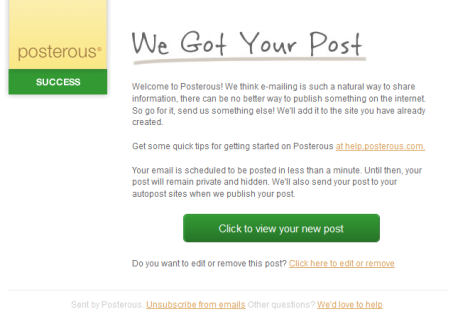 Posterous recognizes your email address and creates a dedicated blog for all content sent from that email address. The subject line of your email becomes the header or title of the post and the content of the email becomes the actual blog post. Any attached photos are automatically turned into a photo gallery and inserted into your post. After sending your first blog post, you'll receive an email from Posterous with links to your new account. Be careful with email signatures though, as you may not want to post your phone number or other information and they can make a blog post look awkward. Adding “#end” to your email will prevent Posterous from posting anything that follows the “#end” tag. If you can send an email, you can write a blog. Time spent tinkering and setting up your website is kept to a minimum. To unleash the true power of Posterous, however, you’ll need to open an account. When you visit your first post, you’ll be provided options to register an account. Autoposting to multiple accounts is where Posterous really starts to shine. Say, for example, that you’re at a conference and want to post an idea to your Twitter and LinkedIn accounts along with a Facebook update and a post on your WordPress blog. Normally, in order to do that, you’d need to individually open each account and create a post or update for each account. With Posterous, all you need to do is send an email to post@posterous.com. Posterous formats your email and distributes it throughout your social media accounts. Posterous can post directly to any of a number of social media platforms. But let’s say that you don’t want the post to go out to all of your social media channels. Say you just want to post a photo from your mobile phone to your Twitter and Facebook accounts. Change the email address to read twitter+facebook@posterous.com and Posterous sends the post only to the social media platforms specified. 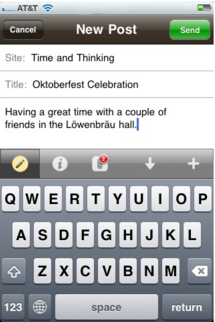 Posterous can also turn any smartphone into a mobile blogging platform. The iPhone app includes settings for autoposting, adding photos and managing multiple Posterous accounts. 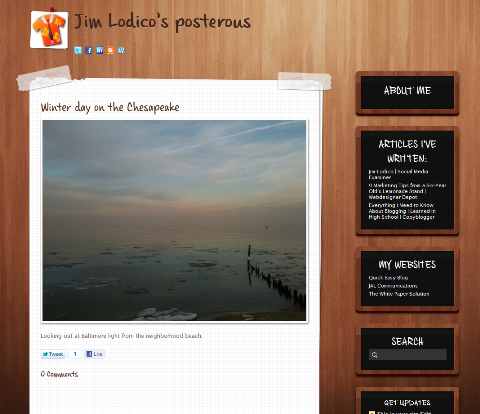 I’m a dedicated WordPress user and have no plans to switch everything over to Posterous. However, there are times when I’m on the road and want to post a quick blog update. In order to do this, I need to boot up the laptop, upload any pictures, find a WiFi connection, then write and publish the post. With Posterous and a smartphone, all I need to do is write the post in an email, attach photos or video and send it off. Using the autoposting features, Posterous will automatically format and post my email directly to my WordPress blog, send a Tweet and update my Facebook and LinkedIn status. Although it’s possible to post to WordPress via email, I have found it somewhat clunky and it requires HTML coding to get it right. Podcasting is just as easy. Attach an MP3 file to your email and Posterous generates an RSS feed for your podcast. Listeners can then subscribe to your podcast feed through iTunes or other subscription methods. Pushing your blog content throughout your social networks can be a time-consuming task. With the Posterous bookmarklet, it can be done in one step. After writing a post, click on the bookmarklet (which resides in your browser’s toolbar), choose from the selected excerpts or write your own and post it to your Posterous page. From there, autopost will push the content throughout your social media networks. 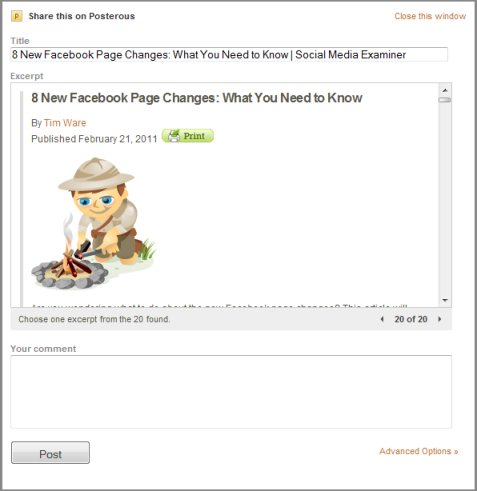 The Posterous Bookmarklet lets you easily share content throughout your social networks. In order to avoid concerns with duplicate content, be sure to include just an excerpt or original summary. Even better, embed a link back to your post wrapped around the appropriate keyword for a backlink to your site. Autopost can be your universal bookmarklet for Facebook, Twitter and your other blogs, without ever leaving the page you're already on. Although my 80-year-old uncle was on Facebook before me, not everyone is as tech savvy. However, if you can send an email, you can join a Posterous group (see image below) sharing blog posts, photos, video and audio files (see example below). Rich media are embedded directly into the email as opposed to as separate attachments. Again, starting and managing a group can be done entirely through email. Send an email to newgroup@posterous.com with the group name in the subject line and email addresses of group members as the email content. In a few moments, you’ll receive an email with a link to finish the registration. 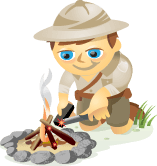 Give the group a description, set access privileges and your group is up and running. Because you don’t need a Posterous account to participate, there’s no waiting on fellow members to open an account or learn a new platform. Group members can post or reply to the group entirely through email. 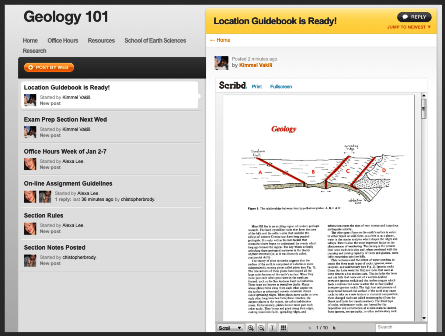 Share notes with your class or articles with your colleagues in almost any format. Checking in on Facebook, Twitter or LinkedIn for messages can quickly become a distracting endeavor. One way to avoid the distractions is to set the social media profiles to notify you via email when you receive a direct message or post to your profile. Add Posterous and you’ve got the ability to fully manage your social media network via email. Refine it even further by creating an email address just for your social media accounts. Limit yourself to only opening the email a couple of times a day and you’ve suddenly got a handle on all those social media profiles. You can email to specific service types on your account. Do you want to update your Twitter, but not your Facebook? You can do that. A few years ago, I wrote a blog post arguing that social media would make email obsolete. As the number of social media channels grows and the streams get more and more crowded, I’ve since changed my thinking. There’s a simplicity to a good, old-fashioned, overloaded email inbox that at times can look somewhat appealing. What do you think? Are you using Posterous? What has been your experience? Leave your comments in the box below.